Atlanta was fun. I’ve changed from this one little visit. I’ll explain. First of all, if you’d like to see what a fire can do to one of your closest friends, take a gander at Chris, who might just be re-earning his old nickname of Bitter Chris. 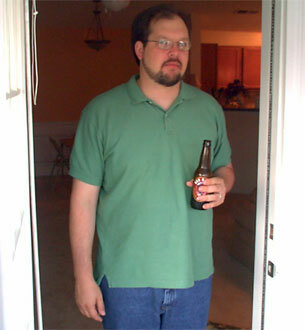 That’s a man who’s a little more guarded about everything he owns in life… which right now is that apartment behind him and the beer in his hand. Don’t even try to mess with that beer in his hand. We went shopping on Saturday. Shopping is something that Al and Chris will have to do every weekend for about a year, I think. 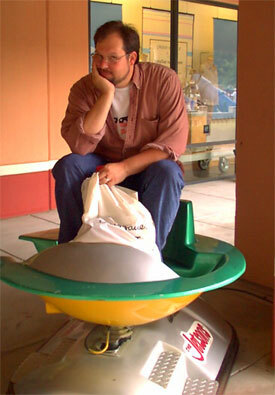 It’s enough to make poor Chris sit in a Jetsons mall toy and pout. Since there wasn’t anything to paint, move, unpack or clean, I wasn’t sure what I was supposed to provide while in Atlanta in terms of help and support. I wanted to do something to make things better and didn’t feel like my simply being there was enough. So with the help of Allison’s mom and a few of her friends, I contacted the florist who did Al’s wedding and got him to recreate her bouquet. Operation Bouquet was a flurry of phone calls and internet searches, frantic emails and photocopying of photographs. But it was a success. I think Allison was a bit confused by the entire thing, but then she and Chris walked down the aisle of their apartment together and blessed the bouquet as almost as good as the original. It’s technically better than the original, as this one isn’t in ashes. 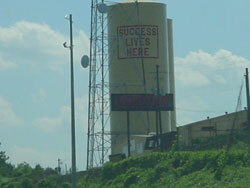 This is the water tower in Lawrenceville. In case you were wondering why none of us were able to make it in our respective endeavors, perhaps it’s because Success is currently living in a small town in Gwinnett County. Way to be selfish, Success. So then, what to do? What do we do with all of this time and all of this free space in their apartment? Every time I see Anna Beth, she threatens to cut my hair. Sometimes she promises. Sometimes she begs, but usually she threatens to cut all of my hair off. I’ve never had a haircut shorter than my shoulders. Ever. So, of course, she cut my hair. To my shoulders. We spent the day walking around proud of my new haircut. But Anna Beth wasn’t satisfied. She had a vision, and apparently she and Allison agreed on that vision while I was at home making them dessert. I had no choice, nor did I have any imput in what was about to happen. Chris just kept shaking his head slowly back and forth. Here you can see that I still had quite a bit of hair before they tied me to that chair and started snipping. She was pretty proud of the first haircut, but knew that if she wasn’t able to plan out the rest of my life right then and there (and she tried. She drew pictures and made pie charts of what I’m supposed to do with the rest of my life), then she was going to give me a new haircut that she could brag about for the rest of the trip. Here she’s proud of the pile of hair we were starting to grow. My hair rolled over their porch like tiny pamie tumbleweeds. AB really couldn’t be any prouder of herself. 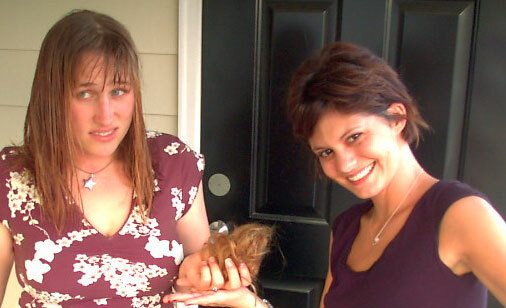 And then she cut off all my hair. She spent the rest of the night keeping Al and Chris entertained my slowly hacking away all of my hair, and I now have the shortest haircut of my life. Twenty-eight years I’ve had hair below the shoulders, and now suddenly I don’t. I’m flipping my head around. I’m able to use hairclips for the first time in my life. I sort of look different. How different? Well, I’d show you, but AB and I couldn’t stop drinking coffee the last morning she was in town while Chris and Al were at work. 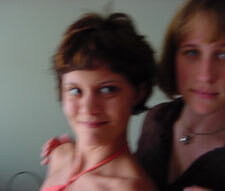 Consequently the photograph of us is mostly of her, and is so jittery from coffee love that my hair and I are barely in it. It looks like she’s kicking me, doesn’t it? I’m all pouty. But it comes to my jawline and angles down in front and if I kind of looked like Patricia Arquette before, now I really look like her. AB won’t stop until I bleach it blonde, but for now I’m trying to acclimate to my new head. It feels different. I keep trying to pull my hair out of the back of my shirt, or pull it up and tie it into a knot. But there’s nothing there to pull. 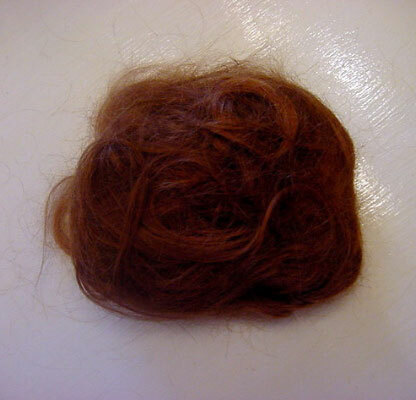 There’s my pile of hair, right there. It ain’t exactly pretty, but it’s mine. A swirl of hair that fills an entire Ziploc bag. And now here’s where you come in. You have the ability to purchase your own bag of history. Welcome to the very first pamie.com eBay auction. You can win your very own pamie.com bag o’ hair. This is totally Anna Beth’s idea, and Allison’s evil nod of approval that has brought me to this new era on my website. I cannot believe we are doing this, but it’s for a good cause, so okay. Please don’t buy my hair and be nasty with it. Please only use my dead skin cells for good. And if you clone me, please make sure my mom gets a clone. She’d like one. The bidding’s going on right here. Consider it the pamie.com 5-year anniversary door prize. Good luck, and may the best Squishite win. Berkeley bookstore Cody’s Books offers free shipping. Order a copy of Why Girls are Weird. Or you can read an excerpt. Hate “The Man?” Order your copy from your local independent bookstore.